Fintan Lucy's highly original songs resonate with folk, blues, gospel, country and world music influences showcasing the versatility of his singing voice. 'Utterly passionate…an all round gem…refreshingly timeless' is how the Irish Examiner described his 2002 album 'The Is and Was and Maybes'. Fintan, already a seasoned busker, started gigging solo around Cork city in the mid 80s, and soon found himself on the Irish trad pub circuit, singing and backing tunes. He was a member of folk/trad bands Duchas and Pluckfocailwindskin, and the acoustic rock harmony band The Phintones. As a solo act he has performed around Ireland and in New York, England, Wales, Spain and Switzerland. His song 'Peace will Come Again' is featured in full in the soon to be released US movie Blind Pass. His songs have been recorded by Rory McCarthy and by Cork-based Wexford songwriter Lynda Cullen, with whom he gigs regularly as a duo since the two anchored the Songlines folk club which ran in Cork from 2009 to 2010. His newest project is Go Rev, a duo act with fellow Cork songwriter and pianist Dee Power. 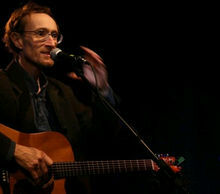 He has taught songwriting at The Munster Literature Centre, and facilitates community music workshops around Cork. Fintan's solo set at L'atitude will feature mostly his own songs, with two or three numbers from his wide and wildly diverse repetoire of covers.